The Greek mercenaries were a long way from home. With Cyrus dead the victory belonged to the king. Cyrus’ Asiatic troops had fled or deserted. The Greeks found themselves isolated and in a strange land surrounded by the thousands of men they had just tried to kill. Their baggage train had been ransacked, so they were low on supplies. The defeat prompted a change of motivation for the mercenaries. They missed their families and lacked the safety and self-enrichment that Cyrus had promised after he would take the Persian throne (Waterfield, 2006). Meanwhile, a messenger from Artaxerxes arrived and demanded their surrender. The king had ordered that they surrender their weapons. The Cleaner of Arcadia who was the oldest man there said that he would rather die than surrender their weapons. To surrender the weapons, would possibly mean that they would lose their lives. So the message was sent to the king that they would be worth more as friends with weapons in their hands rather than someone else’s and they would be more effective enemies with their weapons in their hands rather than someone else’s’ (Xenophon, 2009). Although the king had sent a message to surrender the previous day, he sent heralds at sunrise to negotiate a truce. The messengers asked to speak to the Greek leaders. At this point the men were getting hungry because they had nothing to eat. Clearchus told the messengers that they must fight first before the truce because the men had nothing for their morning meal. The messengers’ road away and came back with guides that could show them were they could get provision. They made their way to the villages where the men said they could get their provisions (Xenophon, 2009). Days became weeks and eventually the generals of Cyrus’ army were arrested and slaughtered. After considering the reasons which he had joined the army Xenophon has a dream in which his father’s house was struck by lightning and burst into flames—a sign that Zeus would illuminate his household. Upon awaking he delivered a speech that blended encouragement with a bid for generalship. The decision was unanimous and Xenophon was elected a general. Other generals were also elected to replace the ones who had been lost in battle as well (Waterfield, 2006). Unanimous assemblies were not always the norm, but the Ten Thousand maintained a hierarchy of generals, officers and men. The most urgent need of the men was always food, and to find a way home. There was a variety of other people who had lower ranks that comprised the camp followers and slaves. Some of them were women or elderly. This must all be taken into consideration. The camp was basically like a small city. The minority view was not widely accepted in the middle of a unanimous assembly. The Greeks demonstrated from time to time intolerance for minority view. They would even resort to exile without appeal (Dalby, 1992). Xenophon and the Spartan General Chrisophus would lead the retreat of The Ten Thousand who were trapped deep in the Persian Empire. The group would travel along the Tigras, across Armenia to Trapezus and then on to the Black Sea (Xenophon, 2004). 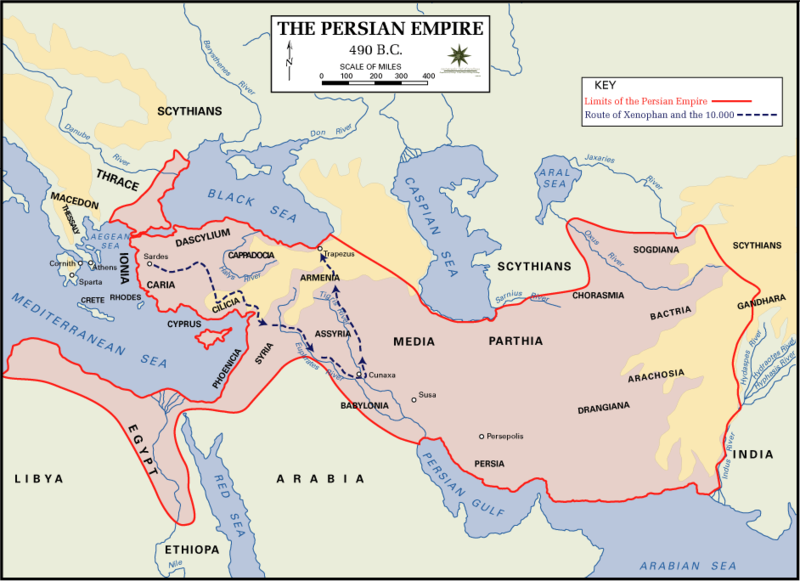 Below is a map of the shows the route of The Ten Thousand from the beginning of the journey to the end when they arrive at the Black Sea (Persian Empire, 2009).